On 15th June, 2017 Bangladesh face a familiar opposition. An opposition that knows the strengths and weaknesses of Bangladesh fully and an adversary that is stronger in every cricketing department compared to the Tigers. With the batting firepower, bowling variety and track record in ICC tournament, no rational cricket fan would dare to write-off India as the tournament favorites and potential champions. So the big question is what must the Tigers do to try and beat India in the upcoming semi-final game? Iftekhar Khan highlights six vital areas that could change the outcome in favor of Bangladesh as the underdogs. If there is one aspect where India is invincible it is when they are chasing. The Indian batting lineup is so good that it creates pressure on any other team batting first to force the pace. As SA found out, trying to force the pace also plays right into the hands of the very intelligent and economical Indian bowling lineup. Mash must win the toss and take India’s chasing capability out of the equation. If we look at India’s performances, their batting is simply a run making machine. It does not matter if Kohli or Yuvraj score a duck, this team just knows how to compile 300 plus totals like bread and butter. What the Tigers must do first of all is to have self-belief even if our bowling gets outclassed at the halfway mark. They must take heart from Sri Lanka in this tournament and also look back at their 340 runs innings during the practice matches in Ireland. With the twin centuries by Ryad and Shakib and the centuries scored by Tamim earlier and the run a ball 70 by Mushfiq against England, the Tigers are in the batting form of their lives as a unit. If we can score 266 even after going 4 down for 30 runs, we can definitely chase 300 and beyond if it comes down to it. Dear Tigers, you need to BELIEVE! In this tournament India’s strategy has been quite obvious. They go slow at the beginning without losing a wicket and then launch into an attack after the 1st power play overs. The key for the Tigers is not to get into a false sense of security if the Indians go slowly at the start. Our opening bowlers should not make the mistake of bowling for containment but rather go hard at the openers searching for wickets. We must set attacking fields so that edges do not fall into vacant slip areas and keep the mid-off and mid-on up so that both the openers are forced go over the inner ring for any scoring opportunities. 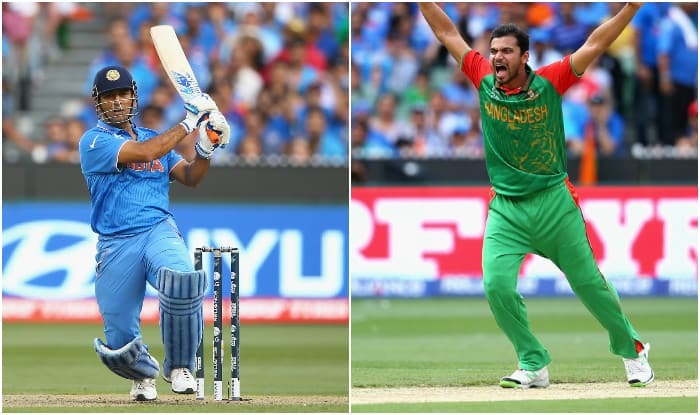 Mashrafe as captain must be prepared to get early wickets within the first power play even if it means conceding some boundaries. Rohit Sharma seems to be the one that can be put under pressure, and perhaps the only guy who can lapse into an error in judgement. We need to disrupt India’s initial gameplan and force Rohit into a false stroke. Mustafiz has got the better of Rohit in the past by getting him to drive through cover. What worked with NZ will definitely not work with India. If we gamble bowling Mosaddek during the death overs India will punish us badly and take the game away. We must stick to our specialist bowlers throughout the 50 overs and pick 5 specialist bowlers. The Indians eat part-time spin for breakfast and they will love the opportunity to milk the runs and set a platform if Mash goes to somebody like Ryad and Mosaddek during the middle overs. Our options need to be Fizz and Mash at the start, Taskin and Rubel as first change. Shakib and Mash in the middle to control the innings where Mash completes his quota. Then Rubel and Fizz at the death. We cannot risk bowling either Taskin or Mash at the death and we must not also risk Shakib at the death against all the Indian left handers. We cannot afford to drop any of the top 7 Indian batsman. These guys are hard to get out as it is and dropped chances will make our mission exponentially difficult. The captaincy from Mash was excellent vs NZ. The run-out of Kane Williamson while he was batting with Taylor came about because of the pressure we built during the middle overs with men inside the ring and the tight lines. We must look to do the same even at the expense of a few boundaries. Mash must remember that the only way to stop the Indian batting is to keep taking wickets at regular intervals. If the Indians get to the 40th over with only 2-3 wickets down, then no bowling attack in the world can stop them from the demolition to follow. We must do the damage early and in the middle overs to stay in the game. We have come a long way in the last 3 years. We beat teams above us in the rankings at home and we have also managed to win away from home. We were able to do this primarily due to our core group of experienced players Shakib, Tamim, Ryad Mushfiq and Mashrafe. However, as good as they are right now, they do carry the mental baggage of the past when we would lose crunch games from winning positions. If the pressure mounts on the senior players, they might all instinctively go on the defensive and lose the battle mentally. This is where we need the younger players, who came into this side during our rise, to really step up. We need these guys to play their shots with freedom and aggression. Soumya and Shabbir need to target the Indian medium pacers as if there is no tomorrow, disrupt the rhythm of Umesh Ashwin and co, and try to take control of the Indian bowling. The duo needs to watch closely what Gunathilaka did for Sri Lanka not even a week ago. The Tigers go into this game on the back of one of the best comebacks in our history and that should hopefully provide enough confidence to take on India. Remember that we were a single run away from victory in the T-20 WC against them. Just like in that game, if the pressure mounts, the Indians will have calmer heads and the experience to deal with it. This is where we will need the younger guys like Soumya, Shabbir and Mosaddek to soak up the pressure away from Tamim, Shakib and Mushy and script their own story of heroics. Nobody expected Sri Lanka to win the WC in 1996 or Pakistan to win in 1992 but they did with some stellar individual performances at key times and with a dosage of luck. Although we do not have somebody as skillful as a Ranatunga or an Imran Khan, we do have our own hero, the old warhorse Mash, who keeps defying career threatening injuries and fight for us. The rest of the guys do not need to look at any other individual for inspiration and passion. With Mashrafi in charge we have the best captain in our history in charge of the best team we ever had. Come 15th, let us go out there and make history! About the author(s): Iftekhar Khan is an avid follower/borderline fanatic of Bangladesh Cricket who goes by the alias Jadukor in BanglaCricket. He currently resides and works in Thailand. This page has been viewed 9732 times.